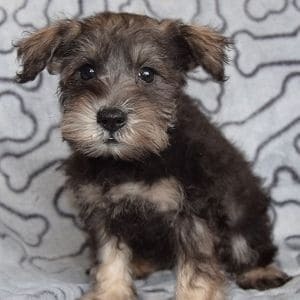 Note: Although the breed standard is to crop the ears, Ridgewood Mini Schnauzer puppies for Sale in PA have natural shaped ears, so as to not run a risk of infection as a puppy from cropping. Temperament: First, Mini Schnauzers are an intelligent, loyal, affectionate and happy breed. They are energetic and playful with children, although they are calm and behaved indoors. They enjoy a proper master, so they are very obedient when well trained. Schnauzers are very devoted and are always alert, which of course, makes them great watchdogs. They enjoy adventure, and are great for walking partners and agility training. 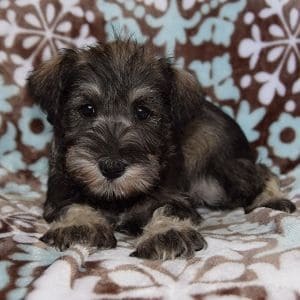 Ridgewood Kennels has been placing Schnauzer puppies for sale in PA, NY, NJ, DE, MD, RI, and farther for more than 40 years! 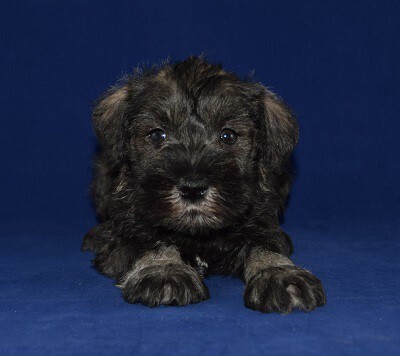 All of Ridgewood’s Mini Schnauzer puppies for sale go home with a written LIFETIME warranty as well as their puppy shots completed. 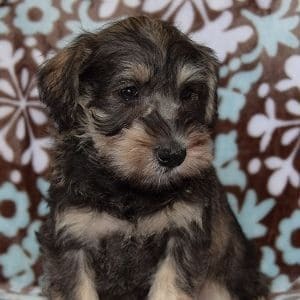 See Ridgewood Kennel’s Mini Schnauzer puppies for sale below! Coat: Wiry when hand stripped but soft and curly when unclipped. 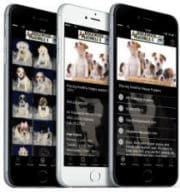 Activity: Although the Mini Schnauzer is calm indoors and well behaved, they benefit from and enjoy daily walks. This breed enjoys outdoor playtime, so they are able to keep up with active families..
Grooming: The wiry coat is not hard to groom, although it does need attention. Comb and brush daily with a short wire brush to prevent matting and keep nails trimmed also. For regular clipping, every 6-8 weeks is recommended for a short length. Shedding: Minimal shedding, which is rarely noticed. Origin: Schnauzers were first known as Wirehaird Pinschers. First, Schnauzers were developed and used as guards and herders on farms in the 19th century. Then over time, farmers bred the Standard Schnauzer into a smaller, more compact size to use for ratting by combining it with the Affenpinscher and Miniature Poodle.The first recorded Miniature Schnauzer appeared in 1888. The AKC first accepted registration of the new breed in 1926. My little Lhasa joined the family in September at the age of 8 weeks and weight of 1 3/4 pounds.She is now 20 weeks and about 6 1/2 pounds. I cannot imagine my life without her! She is so well adjusted. Loves playing with the grandkids and loves attending puppy classes where she can attack all the big dogs! Thank you…you guys are great. I’m hoping to be back in thespring to add a little playmate to the household!